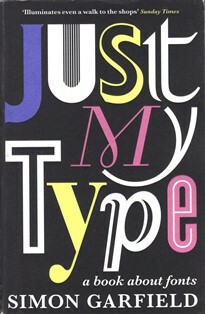 You'll never look at the printed word (or a Russell Crowe movie poster) in the same way again after reading Just My Type by Simon Garfield. This is a quirky and surprisingly fascinating read. Surprising because it's a book about the history of fonts. As in Times New Roman, Arial, Helvetica, Comic Sans and the more than 100,000 fonts in existence today. It's a subject to which most of us would never give a second thought. But now that I've read this book I can't stop analysing the hundreds of fonts I encounter every day, from advertising, posters and signage right down to fonts used on television remote controls, the keyboard I am currently using* and this website**. In Just My Type, Garfield takes the reader on an illuminating and humorous journey through the world of fonts and the men and women who created them. How calligraphy inspired technological revolution in the hands of Steve Jobs. Why Comic Sans is the world’s most hated font with an online movement dedicated to its eradication. How Ikea unwittingly created international uproar simply by changing the font in its catalogues. Why the Nazis outlawed the use of gothic script in Germany in 1941. Which font helped Barack Obama win the 2008 US presidential election. Why Arial is widely considered to be a copycat and a cheat. Which is the most overused font in Hollywood. Why some fonts endure while others fade into obscurity. What your own choice of font says about you. Stop and take a look around you. How many fonts can you see right now? Sounds like a great book! I love quirky facts. I recall reading somewhere that Steve Jobs introduced alternative fonts to apple computers because he took calligraphy classes after dropping out of college. Looks like another one to add to my reading list.